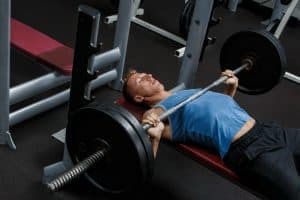 An Olympic weight bench is a popular piece of weight training equipment that can help you build and strengthen your muscles. A weight bench provides you with the rigidity and safety you need in order to bench press using 7- and 8-foot Olympic bars and weight plates. Body Champ have been a quality-driven company since 1993 that brings quality gym products to the comfort of your home. 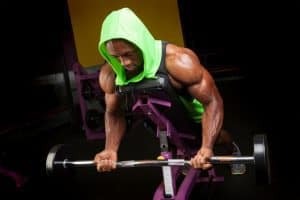 The Body Champ Olympic Weight Bench can accommodate Olympic weights and will enable you to expand your workouts to include chest presses, military presses, and leg lifts. This bench has a freestanding upright build that allows you to do walk-in squats while the leg lift lock allows you to do situps. This well-rounded weight bench is just what you need to create a great home gym that could rival any professional gym. This product can be used by beginners and advanced weight lifters. This weight bench has a maximum weight limit of 300 pounds, so it can be limiting for lifters that can lift more than that. However, it is sufficient for most home gyms for most people. This unit comes with the rack, a two cushion bench, and the leg roller attachment. It does not come with a bar or weights, but these can easily be purchased alongside the bench. 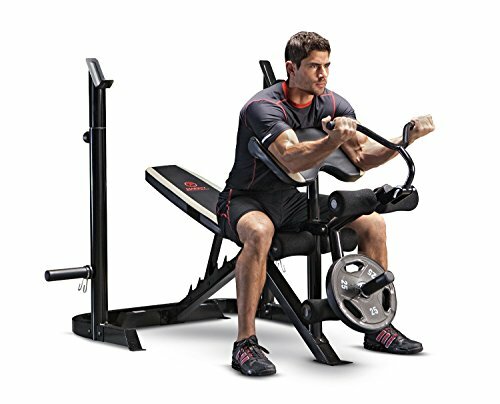 The Body Champ Olympic Weight Bench has a preacher curl and leg extension as well as a crunch handle so you can do isolation crunches. The rack can accommodate a 6- to 8-foot long bar. It is also stable and sturdy enough to use as a squat rack. The bench has a U-shaped leg stabilizer at the front for added safety and stability. This weight bench comes with an adjustable seat that allows you to train at 6 different levels, including a decline, incline, or flat position. It also has an Olympic bar adaptor, allowing you to use a standard bar or an Olympic bar. The safety hooks on the bench provide extra protection. At under $200, the Body Champ Olympic Weight Bench is great value for a high-quality, well-built Olympic bench. It is made from 2.5-inch steel square tubes that create a solid and durable bench unit. All of the faux-leather coverings boast cushions that are padded thickly and filled with high-density foam. The dimensions of this bench allow you to move in an unrestricted manner though your lats. This solid unit has many features and variety to shake up your daily workout. The bench can take a maximum body weight of 300 pounds. The weight on the bar can be set to a maximum of 300 pounds, and the leg extension can handle a total of 150 pounds. This should be more than enough for most home gyms. 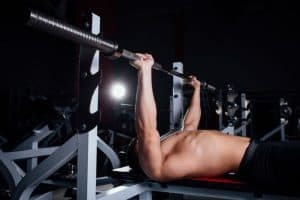 There are many training exercises that can be done with this weight bench, including chest presses, leg curls, military presses, situps, and leg presses. Depending on which exercise you choose, you will position yourself differently on the machine. 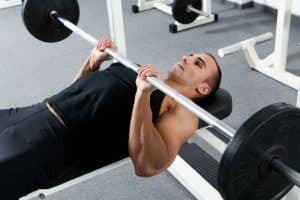 It is best to consult the manual that comes along with this weight bench to see how to correctly position yourself, how to set the weights, and what the various exercises include. This bench allows you to do various exercises that train the whole body. The two-piece design is great for exercises that target arms, legs, and core muscles. The passes vinyl backrest and seat provides durable comfort while the rubber grips found on the handles give you more control, no matter how sweaty you get. You can easily adjust the arm curl and back pad for flat, decline, and incline press exercises. The height of the bar crutches can also be adjusted to suit your arm length. The rack can also be used for lunge exercises and walk-in squats. Made with 14-gauge, powder-coated tubular steel, this bench is rust and water resistant. The weight bench comes with a built-in storage post for the weights you use, creating a convenient and safe place to keep your weights when they are not in use. 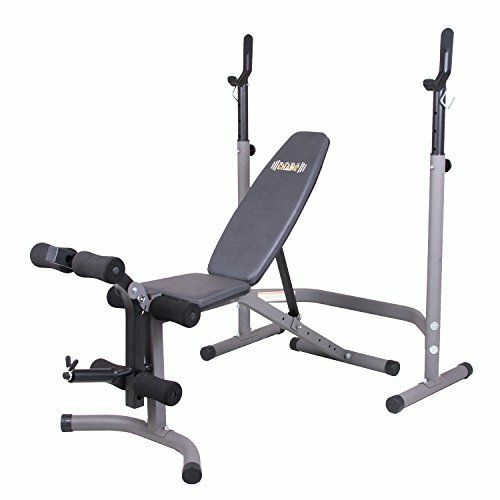 At $250 for the weight bench, this unit is great value for money and perfect for beginners or home gyms. 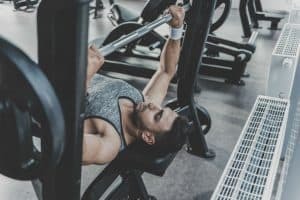 When you are ready to create an Olympic weight bench challenge in your home, you need to get a bench that can meet the rigorous demands in terms of the additional weight and dimensions. But, that doesn’t mean you should spend a large sum of money. The Body Champ Olympic Weight Bench costs less than $200 and offers excellent value for money. 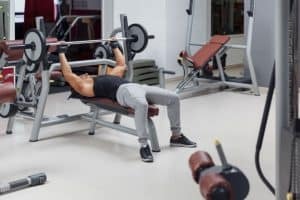 Plus, the durable construction of this weight bench ensures that you will get many years of use from it before needing to upgrade or replace it.